What should we eat to prevent and heal cancer? Author of The Earth Diet Liana Werner-Gray has gathered the best foods for various types of cancer, along with 195 simple and tested recipes created to boost your immune system and promote healing, and explains how to tailor them for... read full description below. 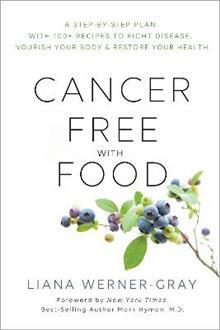 Supported by the powerhouse team behind The Truth About Cancer, best-selling natural-health author Liana Werner-Gray offers a simple yet comprehensive guide to nutrition for those who have been diagnosed with cancer. You've been diagnosed with cancer, and all you want is a simple guide of what to eat and what to avoid to support your health during this difficult time--The Cancer Diet is for you! Liana Werner-Gray offers simple, nutrient-rich recipes that utilize foods proven to boost the immune system and offer you a better chance of healing. The information in this book is supportive of any treatment path; Liana will show you how nutrition can be used on its own or in conjunction with chemotherapy, radiation, surgery, or alternative therapies. 100+ gluten-free, soy-free, refined sugar-free, and dairy-free recipes that you can easily remember and will want to use every day. Recipe options will fit a keto diet, vegan diet, and paleo diet. With this comprehensive guide, you'll feel informed about all the available treatment options so you can choose the right ones for you as you put together your cancer-healing plan. Liana Werner-Gray is a holistic and natural-health advocate. After healing herself of cancer through embracing a natural lifestyle, she began lecturing and teaching about the Earth Diet internationally. She is the founder and owner of the Earth Diet, where she directs a team that helps people all over the world find recipes that work for them. She has helped thousands of people improve conditions such as acne, diabetes, depression, heart disease, obesity, and more.